As a kid I had a Rhythm Maker Drum Set from Consumer’s Distributing. Basically a $50 kit somewhere between toy and real drums, I had countless hours of fun banging away to the likes of David Bowie and other classic rockers. For those whose background doesn’t include classic rock, this video may seem like just another rock show. 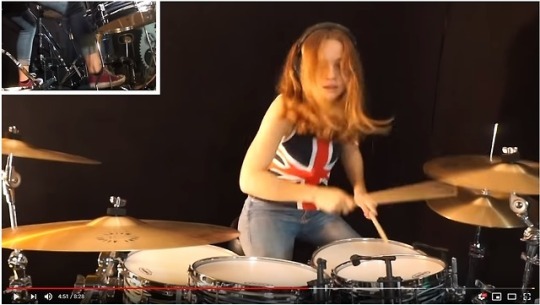 But for those of us who have these drum patterns firmly locked in memory, it’s a joy to see them so clearly illustrated by Sina, one of the coolest young ladies on the web. Also, if you have never actually tried drumming, chances are you won’t fully appreciate just how gifted top quality drummers really are. Myself, I could never get the kick drum (foot pedal) in sync with the snare, cymbal, block and tom. Sina, on the other hand, uses two feet! And her great explanation of why Ringo is a genius.